Abbey Fest 2013 - The Bury St. Edmunds Music Festival - A world stage arrives in Suffolks Bury St. Edmunds Abbey Gardens on the weekend of 19th, 20th and 21st July 2013 with concert attractions for all the family. On this web server 41 other websites are hosted. The language of those websites is mostly english. 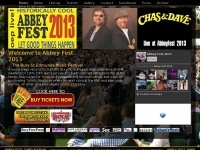 The websites of Abbeyfest.net are served by a Varnish web server using the operating system Unix/Linux (Unix). The software used to serve the webpages was created by using the programming language ASP.NET. The website uses the latest markup standard HTML 5. The website does not specify details about the inclusion of its content in search engines. For this reason the content will be included by search engines. The visitors are redirected to the homepage of the website "/cgi-sys/suspendedpage.cgi".